The Brass and Iron is the good buy on buckles. It is good for Military or Civilian use. A sturdy buckle. 3″x1 7/8″ and will fit our latchets. Military #1, White Bronze, has a small face to the buckle that would be correct for the early part of the 18th Century. A small plain brass buckle that will still fit a 1¼” latchet. Nice for the soldier or townsman. The price is $35.20 per pairs. 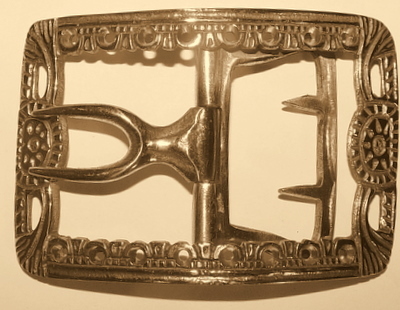 Rope Buckle in White Bronze: A Gentlemen’s buckle. It states a certain class in dress. This will fit our latchets of 1 1/4″. Overall measurements 2 1/8″x 2 1/5″. 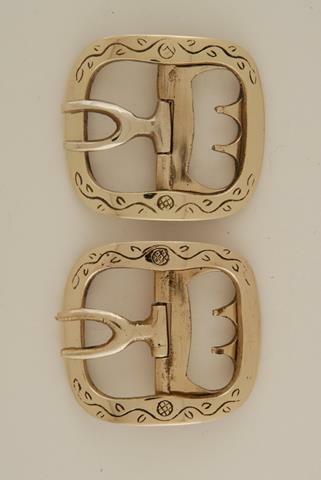 The Ribbon buckle is a smaller buckle that fits the ladies style, it is 1-7/8″x 2″ and fits on our 1-1/4″latchets. 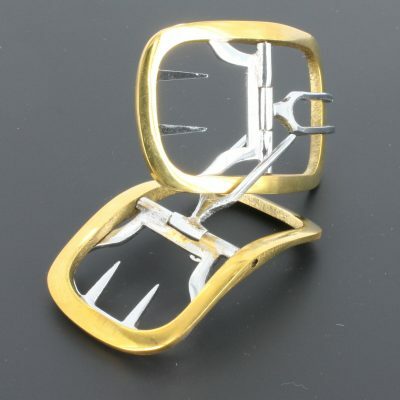 Reflecting the design of a ribbon, this brass Buckle is suitable for Ladies. Price is $35.20 per pair.